John prepares the marinade for the cod with some input from me. I ask him to cut down on the heat because I am still feeling the effects of last night’s jerk chicken. He substitutes regular paprika for the hot paprika and leaves out the harissa he is planning on using. I think by changing some of the ingredients the whole flavor of the dish is thrown slightly off. I precook some slabs of Yukon Gold potatoes. They make the base that the fish will bake on. 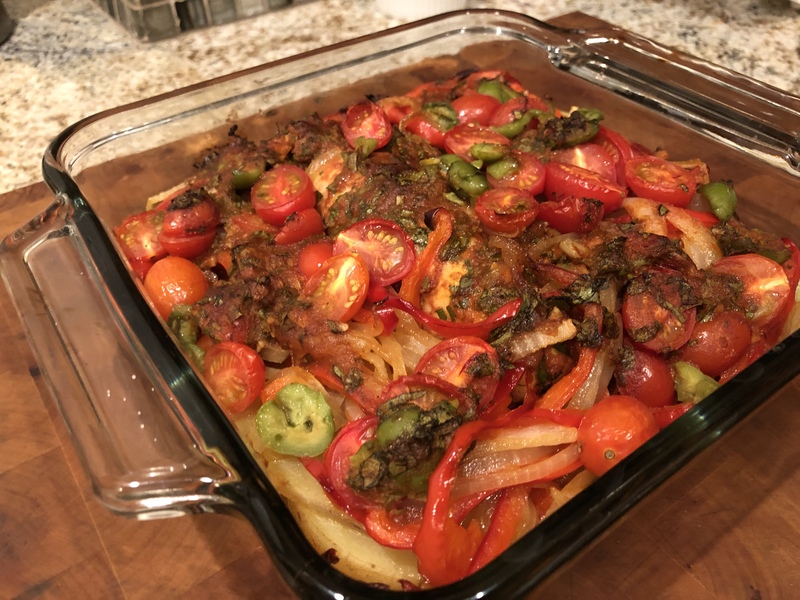 Over the top of the fish are sautéed onions and peppers, cherry tomatoes, olives, and the marinade. Here is how it looked coming out of the oven. There is fish under there somewhere! The potatoes are delicious but the cod which John cooks beautifully is oddly floral from the saffron. I suggest that if we try it again we might go in a more Italian direction. I think John is miffed that for the second night running I am not happy with the protein. He would like to keep the dish Moroccan but add the spicier spices back in. I suggest that if he wants it that way I will make something different for myself. The discussion goes downhill from there. No doubt all will be well tomorrow when we make Afghani dahl with tabbouleh. We both like that! 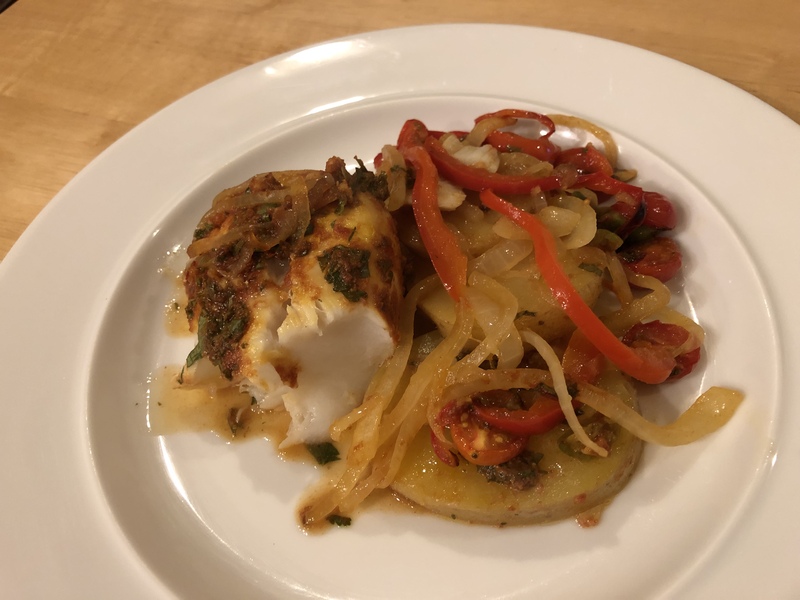 This entry was posted in Fish, Mediterranean, pescatarian, Vegetables and tagged cod, Moroccan, potatoes. Bookmark the permalink.